"hereafter no territory on this continent [referring to Central and South America] shall be regarded as subject to transfer to a European power." Thus, we desire that the Americas shall not become protectorates or colonies of European Powers. We shall view any such attempt as a severe provocation. Belgium pledges to remain neutral in all European matters and is only interested in the Congo Territories in Africa at this time. We will restrict all colonial adventures to the Dark Continent in the Congo Environs. We believe this can be a very rewarding Continent, yet dangers abound as well. We suggest all European Nations restrict their African Adventures to Diplomacy and not resort to Military Strong Arm Tactics. Granted, we understand certain Pacification of hostiles may be Necessary in order to open these Regions to Civilization. We believe there are plenty of Colonial lands for all.....in Africa as well as the rest of the Known World. * We support the statement of the Belgian government in which normal conduct of affaires between nations must be peaceful and civilized. Unprovoked aggression, or without a valid CB, especially against minor nations, will be considered as unfriendly. * We have decided to opt for an open trade policy and a laissez-faire economic approach, meaning we won't interfere in business negotiation between private entrepreneurs. Nevertheless, we shall require that all such discussions involving our national territorry be advised beforehand to our Ministry of Interior and Economy for approval. We wish to organize in the coming months a grand colonial conference in Berlin where all civilized nations shall be invited and receive a warm welcome. The Imperial government finally extends to all nations an invitation to proceed in peaceful and constructive diplomacy. We shall listen to all parties, old enemies included, with open mind and ears, and will strive when possible to find compromises and balanced agreements. The main industrial managers of Lorraine from both sides of the border have held an important meeting at the Stanislas Palace Hotel of Nancy, France, last 15th February 1880. The shareholders of the Petite Roselle Minen GmbH have sold all their shares to the Chargeurs SA company of France, which now runs the newly renamed 'Charbonages de Gandrange' coal mines near Metz, Lothringen (Germany). In exchange, the original German shareholders have received majority equity in the 'Compagnie de Mayotte' which was controlling most trade affairs and representatives in the Comorros archipelago, off Madagascar. The company has consequently changed its name to 'Komoren Inseln Gesselschaft' and has been re-incorporated at the Lübeck stock exchange. In effect, all interests and assets in the Comoros islands have passed under German control, while half of the coal production in Lorraine is now property of French industrialists and shipped regularly among the border. It seems that businessmen on both sides are more open to agreement that their respective governments, but the latter could not be reached, and thus have not commented or reacted for the time being, as we were told that their official position is to uphold an economic laissez-faire policy. Today, a squadron of 4 former Ironclad battleships of the German navy was transferred to the Royal Dutch Navy, in the cadre of a friendship and good neighbour partnership between the two nations. The German crews disembarked at the Dutch naval base of Texel before returning to Wilhemshaven by train. Their fellow Dutch midshipmen and officers took charge, although it may take a month before the ships become operational again. A symbolic financial transfer occurred when the ship's emblems were given to the representatives of Holland. It is rumoured that the squadron should soon sail for the embattled Dutch East Indies, where the ongoing war with Aceh drags on. Some well informed sources also mentioned to our correspondent that part of the ships payment would consist in some exotic merchandises from those same islands that would be shipped to the trade houses of Hamburg in the ensuing months. C - Balance of ships' cost paid in goods from the NEI (1 of ea Silk, Rice, Coffee and Sugar) every months for 2 years. Today, a squadron of 3 former Ironclad battleships of the German navy was transferred to the Imperial Chinese Navy, in the cadre of a commercial agreement between the two nations. The German crews disembarked at the Chinese naval base of Shanghai before returning home by liner. Their fellow Chinese midshipmen and officers took charge, although it may take a month before the ships become operational again. A symbolic financial transfer occurred when the ship's emblems were given to the representatives of China. This deal is part of a more general commercial agreement, as some well informed sources mentioned to our correspondent that part of the ships payment would consist in Chinese tea and silks that would be shipped to the trade houses of Kiel in the ensuing months. C - Balance of ships' cost paid in goods (2 of ea Silk and Tea) every months for the coming year. Today, a squadron of 3 former Ironclad battleships of the German navy was transferred to the Ottoman Navy, in the cadre of a commercial agreement between the two nations. The German crews disembarked at the Ottoman naval base of Smyrna before returning to Wilhemshaven by train. Their fellow Ottoman midshipmen and officers took charge, although it may take a month before the ships become operational again. A symbolic financial transfer occurred when the ship's emblems were given to the representatives of Turkey. The German treasury has offered some credit terms to the Ottoman finances, with light interests. Part of the payment will consist in rare minerals and medical opiate supplies. C - Balance of ships' cost paid in money and goods from Turkey (3$ each turn, 1 Opium, 1 Minerals) every months for 3 years. Dateline 5 Mar 1880, Washington D.C.
We protest the Chinese attacks upon our commercial establishments. Our Amoy concession in the province of Xiamen was seized by armed bandits. We demand that the government of Empress Cixi stop these blatant attacks upon American businessmen. Some bandits are quick to hit and run...may be they held grudge or business conflict with the local US Consul....who knows who will be hit next time..
German Navy Going Going Gone! Ships have been leaving German ports for points East (China), Southeast (Ottoman's), and West (Holland). And it has come to our attention that Ships were offered to our own fair Nation. What is going on??? Sources in the know have varying thoughts. Germany will be refitting with magnificent State of the Art vessels that can take on Anything in the Seven Seas. Germany is becoming a Closed Shop.....looking inward, becoming Conservative, becoming less War-Like. Germany is Gearing Up for Major Land Battles in the near future. Lots of Opinions being thrown around. Germany has also Very Quickly agreed to the United States announced Stay Out of the America's if you are not already Here Monroe Doctrine (Monroe is the name of one of their Presidents from many years ago......who first suggested this notion...back in 1823). This reporter for one wonders, What are they up to? Are they actually facing South....as our Nation seems to be. Internationally, our own King Leopold is determined to exercise every opportunity to expand in the Congo to the benefit of the Belgian Nation. Will there be darker faces working in Antwerp shortly? The Congo 'Company' has been hiring rather heavily. Belgians going to the Dark Continent. It is an interesting time for the World, we at the Globe note. The Kaiser has requested our Navy to modernize and find a way to reform older ships and get latest state-of-the-art ones. Instead of scrapping the vessels and collecting back the materials, it was agreed to offer them for sale to our friends and neigbours. For information, we have still some deal pending, offers in the way from some minor nations, and still 3 frigates ships that will be on sale once they return from their overseas duties. This is in no way a buildup, as we are replacing 1:1 the older units, and we already gave insurances about this to concerned naval powers. It's not the admiralty duty to comment on foreign policy, but we have been authorized to state that the German Navy's role will be to enforce protection against piracy and protect free commercial activity. Germans guns are tried and ready, but shall mostly focus on protecting European traders in the savage lands. The Government of the French Republic and Germany proposed an agreement to freeze troops on our respective borders. Germany is parked no new force in Alsace or Lorraine for a period of 10 years. Respectively, France parked no new units Meuse and Vosges. A commission of French officers conduct an annual inspection of the forces of the German Army (not navy). This commission (and all its expenses, $ 300) will be financed entirely by France and the amount paid to Germany. If ever Germany does not allow annual visit will lead to a financial penalty double Planned Spending ($ 600), or a default if not Casus Belli immediate refund. This agreement is a great day for peace in Europe. Without provocation or legal justification, French troops invaded Tunisia and seized Tunis, the capitol. France stormed into an independent country in an effort to expand its already large empire, will any of the powers in Europe protest this seizure and ask the French to withdraw? King Umberto, was alarmed at such French boldness and requested Prime Minister Benedetto Cairoli to send a letter of protest to Paris. We intend to adhere closely to the Monroe doctrine. We will not enter into any alliances at this time, as we wish to be friendly with all. This will encourage free trade and enterprise between our nation and all others, which is a top priority of our government. We guarantee Belgian Neutrality as set out in the Treaty of London. Any nation which violates this neutrality will face an immediate military response from the United Kingdom. The Times: Numerous raids in Algeria by the Tunisian Kroumer tribe were reported. The French government prepared an expeditionary force to defeat the tribesmen. The Italian influence in the area is an issue - due to the huge colony of Tunisian Italians that had immigrated to Tunisia - that could initiate a long period of Franco-Italian tension. Le Monde: De nombreux raids en Algérie par la tribu des Kroumer tunisiens ont été signalés. Le gouvernement français prépare un corps expéditionnaire pour vaincre ces tribus. L'influence italienne dans la région (liée à l'énorme colonie d'immigrés italiens en Tunisie) est une question toutefois qui pourrait amorcer une longue période de tension Franco-italienne. El Pais: Se informa de numerosos ataques e incursiones en Argelia, provocados por la tribu tunecina de Kroumer. El gobierno francés prepara una expedición para derrotar a los guerreros tribales. Pero la influencia italiana en la región, debido a la gran colonia italiana que ha emigrado a Túnez, es un problema a tener en cuenta. Podría causar tensiones en las relaciones franco-italianas. Die Süddeutsche Zeitung: Aus Algerien werden zahlreiche Überfälle des tunesischen Kroumer-Stammes berichtet. Die Regierung bereitet eine Expeditionstruppe zur Bekämpfung der Stammeskrieger vor. Der italienische Einfluss in der Region, der sich durch die Auswanderung vieler tunesischstämmiger Italiener nach Tunesien begründet, stellt jedoch ein Problem dar, der eine lange Spannungsphase zwischen Frankreich und Italien einleiten könnte. The France are proposed a solution with your gouvernamant, your answer is not and none counter solution. So the France use the power of France for defence the interest of France in Tunesia. The other reality is tribal nation need education and good school, for them a fast conquest is really more good compared a long colonisation. For all, the France have only interest of North Africa in Tunesia and Algerie, not other colony, excepte for war and if other country begin the war. For finish the answer, many troop go now on Savoie, and other border territory with Italy for to calm that country, I no go war, but I have the army for defence my country! OOC for the Spanish edition use ABC, el pais is a modern newspaper. The American government is extremely worried regarding the apparent breakdown of negotiations, and increase in tensions between France and Italy. We urge all parties concerned to settle this dispute peacefully, without resulting to war. The modern Ironclad battleships brought from the German Empire are finally completely manned and outfitted. This mighty vessels will be sent to reinforce the Black Sea Feet. The governor of Wuchang, acting under authorization of the central government in Beijing, has held yesterday a meeting with Herr Wolfram von Dreyse, head of a delegation of German business interests and Honorary Consul of the German Empire in Wuchang. An agreement was found so that German capital could be allowed to invest in an arm factory in Wuchang, with guaranteed sale of production to China. Similarly, German investments in the coastal province of shantung was allowed, to the limit of two plantations in the vicinity of Quigdao. It is understood by both parties that those enterprises shall pay all taxes to China, and receive in exchange protection of the imperial forces against local unrest, and that the chinese government shall have a right of first regards if and when those establishment come for sale. Also, the convention gives the Chinese government an option to buy the said investments in China at its faire value after 10 years of continuous exploitation. A - Germany is allowed to build, at her full own cost, an Arms factory in Wuchang, and a silk planatation and a tea plantation in Qingdao. B - The full production of the factory will be offered exclusively to China for purchase, at normal market prices. Taxes on the investment will be paid normally. All unpurchased production can be exported at will by owner. C - The Chinese government guarantees the German investors against seizure (may happen automatically by game engine) for 10 years: if this happen, seized property will be returned with 15 days to German ownership. D - After 10 years, China may offer to buy (at cost) the factory, and Germany shall accept the offer. After receiving a briefing from an unnamed St. Petersburg University professor, the Czar called an emergency meeting of the Imperial Council and demanded that great strides be made in modernizing the Empire. The Czar expressed his distress at how far Russia has fallen behind to the world's great powers. Enormous sums have been devoted to expanding the rail system, and extending lines into the deepest regions of the Empire. His highness has tasked this Ministry with completing a trans-Siberia rail line in five years, and we are pleased to announce that the project is ahead of schedule! Massive state funds - to the dismay of the General Staff - have been poured into modernizing mining and farming equipment, and creating a nation-wide educational system. The Czar hopes these moves will create a base for which industry may grow in Russia. His highness hope that advances in Russian production of luxury wares - such as gold, silk, and opium - may allow for capital to flood the Empire, allowing for more growth! There are of course some who complain loudly of a lack of funds being sent to the Imperial Army and Navy. These subversive elements will be found and dealt with. The Czar has confidence that growth in the economy and other sectors will perhaps allow for investments in the military at some point in the future. His Highness is much more concerned at the lagging state of the Russian economy, and has said that Russia is in a period of peace that can only be disrupted by an outside power encroaching in Russia's sphere of influence, and has high hopes for the Empire and the Slavic people in avoiding unnecessary war in the future. 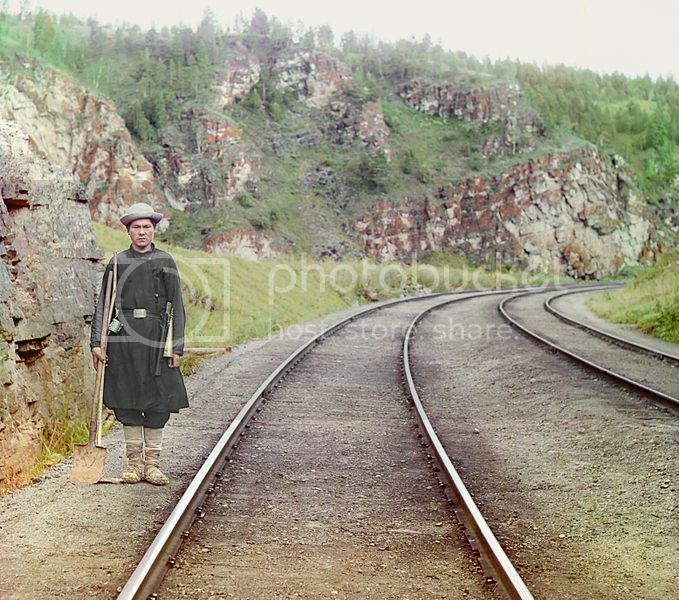 Bashkir switchman near the town Ust' Katav. Wow, color pictures in 1880! How did the Russians do that? You can even see where someone moved between shots (look at # 21, and # 34 for example). Impressive pictures..and giving so much feeling about how it could be 100 years ago...I had seen a few before, that's great indeed. Cool pics! Thanks Bean! Most color 'photos' from the early 1900's were hand colored. The Tri-color method.....I didn't know about it. We are have Higher Inflation due to some difficulties controlling investment capital outlay needed to keep the Country running on a good footing. We hope to have it under control soon. Previous administrations perhaps invested to heavily in certain areas and these are being shutdown or curtailed somewhat while we upgrade and production is placed on a more efficient path. In Game: Have had to close some structures .... Also: we don't seem to have the usual F4 Cards which would allow us to cut inflation down 1% per card.... (Steel, MfgGoods, Coal subsidies)....we only have one card, which is the one that increases inflation. Plus: Does anyone have a Transport vessel or two which they would like to sell for state funds? unclejoe wrote: Plus: Does anyone have a Transport vessel or two which they would like to sell for state funds? Sure. What do you want? One squadron or two? How much will you pay? How about one to start with. (two if they are cheap ) How much do you want?